Unit 4 offers 50,000 sq ft (4,645 sq meters) of floor space. Accessible by 3 large roller shutter entrances. With a hight of approximately 8 meters from floor to ceiling, pallets can be stacked high to achieve excellent floorspace economy. Constructed with only the highest quality materials, this unit is designed to be durable and easily maintained for years to come. 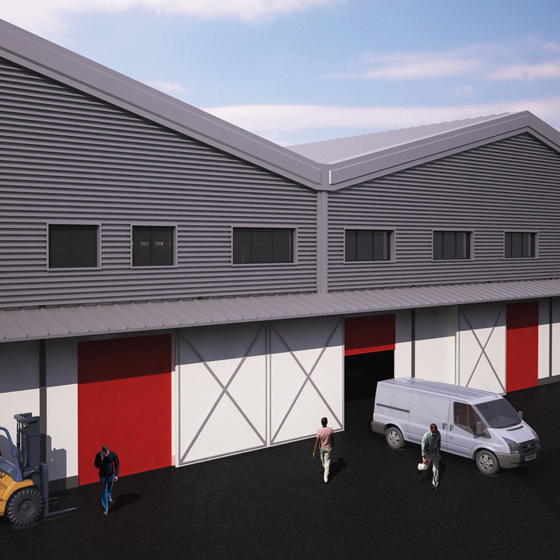 The unit benefits from large loading facilities covered by steel canopies. Washrooms are provided both internally and externally. This unit is now available. Please contact us for more information. The walls of the unit are constructed using pure high grade concrete. Offering exceptional security credentials as well as high levels of cleanliness and durability for years to come. Specifically designed to withstand very high pressures and last through frequent and heavy use, the flooring of the unit is suitable for virtually any purpose. All units benefit from the on-site offices, situated on the mezzanine level of the unit, these small offices provide the ideal space to manage administration and hold meetings. 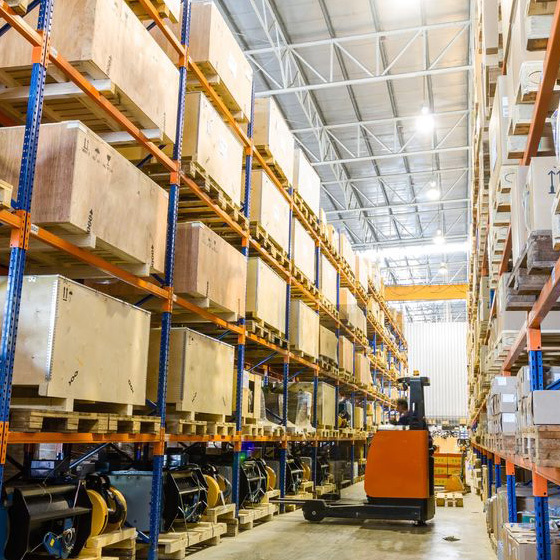 With tall ceilings around 8 meters from ground level, pallets can be stacked very high, thereby allows for excellent floorspace economy. All lighting is provided by Thorn UK, ensuring only the best quality and durability. 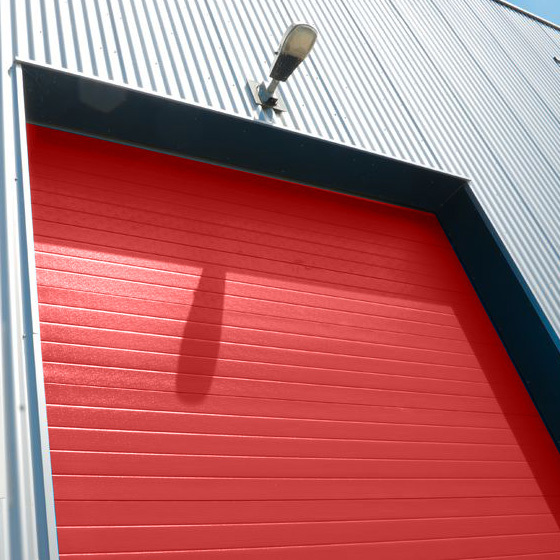 The unit benefits from 3 large roller shutter bays. All covered by stainless steel canopies for enhanced protection during wet weather. There is also plenty of space outside each unit to allow vehicles to manoeuvre safely. All washroom facilities are made from industrial grade stainless steel, perfect for frequent and heavy use. 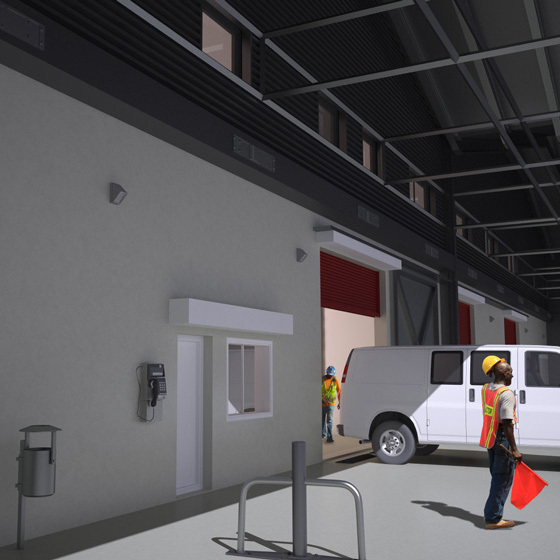 Separate washroom facilities are provided for truck drivers and other external personnel, so they don’t need to come into the warehouse. All units will have a forklift battery charging area with anticorrosion light fittings. The roads within the site are built from concrete to withstand the toughest of conditions. They’re wide enough to handle traffic flow in both directions simultaneously. Road signage within the site will operate a one-way system to provide free flow of traffic and reduce the chance of accidents. Drury Industrial estates will provide and manage 24 hour security guards as well as armed police who will patrol the site during the hours of darkness. The site is also be protected by tall concrete walls and barbed wire as well as CCTV which will provide extensive coverage of the entire site. All units are built to meet stringent fire regulations. Fire fighting appliances are situated throughout the site and within each unit. All common areas will be managed by Drury Estates to provide a clean and safe environment to work. Management will be available 24 hours a day to attend to any issues or answer questions. Ample parking is available on the site and can be tailored to each tenant’s individual needs. Green areas of plants and vegetation are present throughout the site, providing aesthetically pleasing surroundings as well as enhanced environmental credentials.